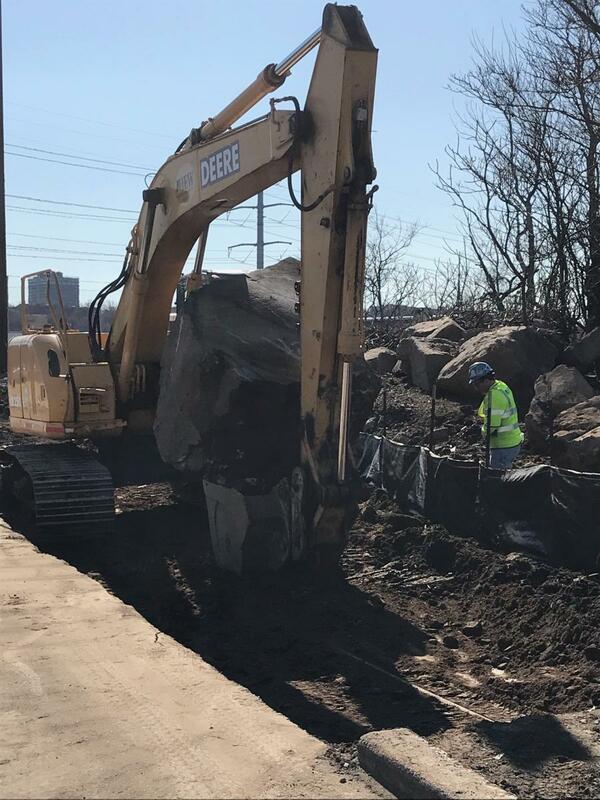 In Trenton, N.J., crews are performing a major rehabilitation of the Route 495 Bridge over Route 1/9 and Paterson Plank Road in North Bergen. The $90.3 million state-funded project to overhaul the nine-span viaduct includes repairs and reconstruction of the bridge deck, replacement and strengthening of deteriorated structural steel and the repair and painting of the substructure. The work will result in traffic delays for drivers traveling to and from the Lincoln Tunnel, but must be performed. 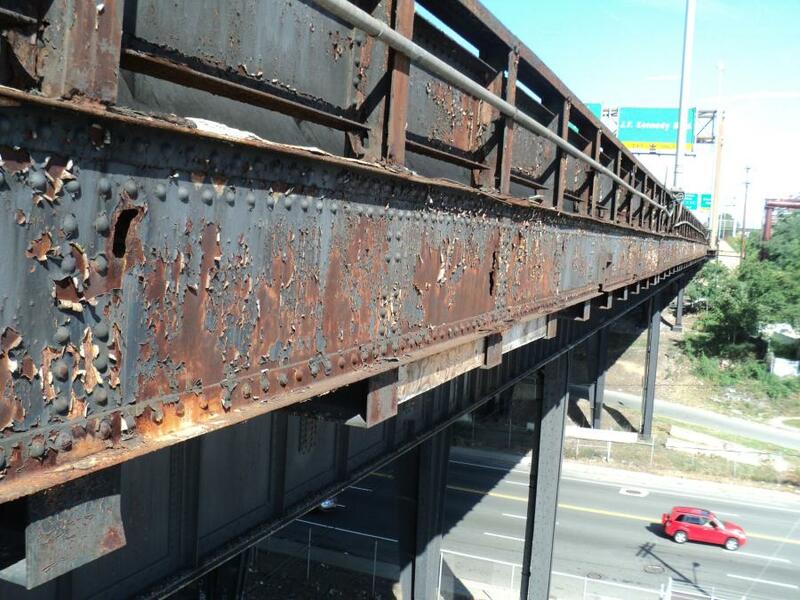 The Route 495, Route 1/9/Paterson Plank Road bridge deck is in poor condition, the structural framing and supporting piers have areas of severe corrosion and section loss, and the existing paint system is in need of a complete replacement. Constructed in the late 1930s, the bridge carries traffic on Route 495 over the NYS&W and Conrail rail lines, as well as Route 1/9, Paterson Plank Road and Liberty Avenue in the Township of North Bergen, Hudson County. Route 495 is a 3.45-mi.-long, divided urban freeway in Hudson County that connects the New Jersey Turnpike to the Lincoln Tunnel. Route 495 is four lanes at its western limit where it meets the New Jersey Turnpike (I-95) at exit 16E. The freeway is mostly six lanes, with an eight-lane section across the Route 495 Viaduct. Route 495 traverses four municipalities in Hudson County. Beginning at the western terminus, Route 495 passes through Secaucus, North Bergen Township and Union City, ending in Weehawken Township. Construction is being accomplished in 12 stages, eight of which are the deck replacement. Improvements to local streets in the surrounding areas that will need to handle some of the diverted traffic during bridge construction is under way. Work is expected to continue this spring under the bridge and along the Paterson Plank Road — Union Turnpike corridor and does not affect peak period motorists on mainline Route 495. The improvements in this phase also include utility relocations and modifications to the NJ Transit North Bergen Park & Ride Lot and work under the bridge deck for the installation of shielding, structural steel repairs and bridge painting. The contract was awarded in June 2017 to IEW Construction Group Inc. Construction of the first phase of the project began in fall 2017, with expected completion approximately one year later. 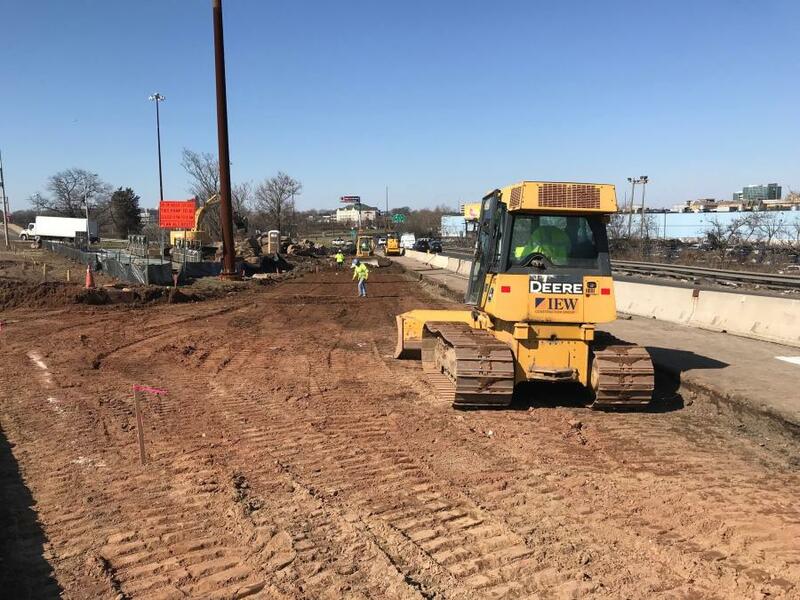 Workers are constructing temporary roadway sections on the Route 495 approaches and local streets to facilitate the detours and staging shifts that will be necessary during the main 495 bridge deck restoration construction phases, including temporary upgrades to Paterson Plank Road. Advance ITS Variable message sign installation also has been completed on Route 495 westbound. The initial stages 1 and 2, which are under way, prepare the adjacent roadways and bridge approaches for the main staging (deck repair) and lane shifts. Stage 3 will detour the 31st Street ramp to 495 westbound and allow for the removal of the existing median barrier. Stages 4, 5 and 6 will reconstruct the deck and parapets in the eastbound direction. Stages 7, 8 and 9 will perform the Route 495 westbound deck reconstruction and parapet reconstruction along with the ramps to and from Route 1/9 to Route 495 westbound. Stage 10 will complete the final median barrier and the final Stage 11 will complete the final roadway approach improvements. According to Dave, the project has limited excavation. The main equipment being used by crews includes lifts, backhoes, creepers, cranes, concrete pumps, blasting and pneumatic equipment and front-end loaders. The most time-consuming aspect of the project will be the structural steel repairs, many that require specific sequencing when removing and replacing existing built-up assemblies. 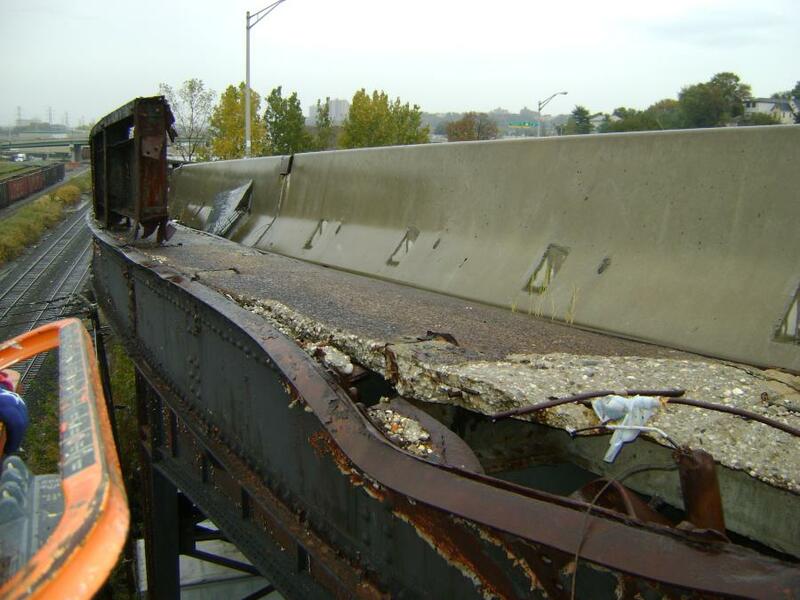 The structural steel repairs will include web, stiffener and flange steel repairs and replacements, as necessary. All of the bearings will be replaced and movable joint areas reconstructed. The work will require temporary jacking of the piers, joints and girder members for various steel and bearing replacements. Drainage improvements will be accomplished by increasing the cross slopes of the bridge to facilitate runoff. The bridge drainage system will be replaced with new scuppers and piping and an upgraded drainage retention basin on Route 1/9. The concrete approach slabs will be reconstructed on either side of the 495 viaduct, guiderail will be upgraded and the approaches will be milled and paved. The second phase of work will begin on the bridge in mid-2018, when traffic restrictions on Route 495 will be initiated. Traffic impacts associated with the second phase of construction, on Route 495, are expected to last for about two-and-a-half years, while the entire bridge deck is replaced. Improvements include the replacement of the Route 495 bridge deck and parapet over the full length of the bridge, and replacement of the bridge deck on two ramps: Route 495 westbound to Paterson Plank Road northbound and Route 495 westbound to Route 1/9 southbound. Extensive structural steel repairs also will be made, along with substructure repairs, complete repainting, drainage improvements, approach roadway rehabilitation, safety upgrades and security fencing. The existing bridge deck will be replaced in its entirety, which includes adjustments to the elevations to improve drainage. Work areas of sufficient width are necessary to provide for improved quality of construction, which will result in fewer future repair requirements. The larger work zone provides a safer work area for workers, and reduces the number of stages required, which increases the safety for the traveling public and allows the project to be completed sooner. Because of the geometry of the existing structure framing and the significant change in vertical elevation to improve drainage, it isn't possible to replace small portions of the bridge deck each night and be able to transition back to the existing deck to allow traffic on it. In order to restore the structural integrity of the bridge, workers need space, meaning traffic detours are unavoidable. The 31st Street on-ramp to Route 495 westbound will be detoured to Paterson Plank Road northbound during most of the phases. Detours also will be needed when the two westbound ramps within the project limits are being rehabilitated. Columbia Avenue and Liberty Avenue will be intermittently detoured for less than one week for approach roadway and structure work in those areas. In order to accommodate the additional traffic that will be traveling on the local streets, temporary traffic mitigation measures will be in place along Union Turnpike and Paterson Plank Road. The temporary improvements include the re-timing of traffic signals and the provision of additional turning lanes at a few intersections along the Union Turnpike/Paterson Plank Road corridor. These improvements are designed to optimize through travel along the corridor. Traffic will be monitored during construction. Traffic mitigation measures will be adjusted as necessary during the project to ease congestion. Beginning in the summer of 2018, the major work will begin on the bridge. One lane of Route 495 in each direction will be closed, limiting the roadway capacity and causing severe congestion. Three out of four lanes in each direction will be maintained during the deck replacement. The exclusive bus lane (XBL) will remain operational during construction. This construction is expected to last for about two-and-a-half years, while the entire bridge deck, parapets, light fixtures, guiderail and drainage are replaced. The entire project is expected to be completed in summer 2021. Each weekday, more than 150,000 vehicles (eastbound and westbound trips combined) travel Route 495's 3.45-mi. length. Truck and bus percentages range from nine percent to more than 30 percent depending on time of day. Transportation connectivity constraints within the project area include rivers, bridges, wetlands, railways and limited access highways. Transit usage is high with various rail and bus options. The closely-spaced ramps along Route 495 westbound within the project limits are a contributing factor to crashes in the area. The permanent elimination of some of the ramps was considered during project design, with the decision being made to keep the ramps. They will be reconstructed as a part of this project and will have to be shut down during certain phases of construction, independent of each other, to minimize traffic impacts on the local roadways. The 31st Street on-ramp to westbound Route 495 will be detoured for a longer period of time during construction, as the high traffic volumes on the ramp would cause safety concerns in the work zone. To mitigate congestion during this project, NJDOT has been working with local officials, employers and commuters to promote several strategies, including switching to public transportation, joining a carpool or vanpool and adjusting travel times around peak morning and evening travel periods. Those affected also may want to telecommute or work at other sites that may be available. Information on road closures, delays and congestion will be available from multiple sources. A community outreach team has been assigned to the project, with the department providing real-time updates to help the public navigate various travel options.